Tebarco’s first priority is answering calls as quickly as possible and diagnosing exactly what our customers need before suggesting a costly replacement or repair. While many plumbing/HVAC companies avoid hiring knowledgeable employees over profits, Tebarco’s technicians are some of the best trained in the mechanical industry. We do the difficult & unusual routinely. When the “cookie cutter” HVAC companies are asked to do any specialty work, they send their customers to US. Our technicians are thinkers and problem solvers for even the most complicated projects. Our work is not completed until the customer is completely satisfied and all issues are resolved. We are dedicated to providing dependable service and superior expertise. We have 13 Master Plumbers on staff as well as licensed HVAC, Medical Gas Pipe and Back Flow Assembly Testers. Our service team members have an average of 15 years experience in the industry. We are a third generation family plumbing/HVAC company in business since 1983. Service is available 24/7 for your needs. With an HVAC Programmed Service Agreement (PSA) in place your business can avoid expensive emergency situations due to oversight. 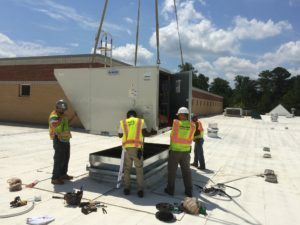 We will create an customized service schedule for your facility based on your needs to ensure that your system is fully functioning and clean. Programmed inspections using a 26 to 59 point check list depending on your model. Guaranteed 4 hour or less response time to emergency service calls. Engineering support and complimentary training of your staff. Reduced allergens and increased air quality. A clean HVAC system is a long lasting, energy efficient system. Take advantage of TMC's knowledge and experience and see your energy costs drop.